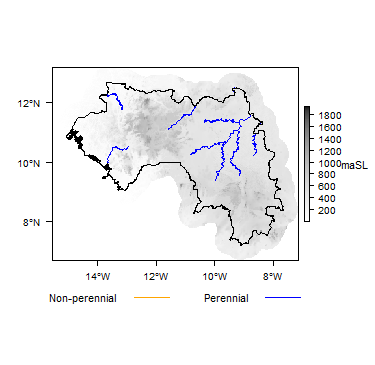 Do you have more information on the hydrogeology of Guinea? Please get in touch. Present-day Guinea was on the periphery of the ancient Ghana, Mali, Songhai and Fulani empires between the 7th and 19th centuries, and its coastal zone was subject to the slave trade from the 16th century. It became a French colony in the 1890s, and the present-day national boundaries date from negotiations between France, Britain, Portugal and Liberia in the late 19th and early 20th centuries. Since independence in 1958 as the Republic of Guinea, the country has experienced periodic armed conflict, attempted and actual coups, civil and political unrest and contested elections. From the late 1980s, Guinea received a large influx of refugees as a result of wars in neighbouring Sierra Leone and Liberia, exacerbating internal tensions. The 2014 Ebola outbreak also affected Guinea significantly. Guinea’s economy is dependent on agriculture and mineral production. The agricultural sector, which employs 80% of the labour force, is diverse, reflecting the diverse geography, with cattle herding and cultivation of savanna crops in highland areas, and commercial crops including fruit, coffee, groundnuts and palm oil in lowland areas. Rice is the main food crop grown for domestic consumption. Forest products, mainly timber, are also important economically. The country has potentially vast mineral resources, particularly bauxite, gold and diamonds, and mineral exports comprise the bulk of export revenue, particularly bauxite, but the sector has not been fully developed, linked to poor infrastructure, continuing political instability and corruption. The 2014 Ebola outbreak was another serious crisis that diverted resources towards basic humanitarian needs. There is large hydroelectric power potential, with the sources of three major rivers - the Gambia, the Senegal and the Niger - in Guinea. Fishing and manufacturing are also important industries. Most of Guinea receives high - but seasonal - rainfall, and the country’s overall water resources are abundant. However, away from the major rivers, surface water resources are scarce in the dry season, and much of the population relies on groundwater for domestic water supplies, both in rural and in poorer urban areas. Please cite this page as: Upton, K, Ó Dochartaigh, B É and Bellwood-Howard, I. 2018. Guinea has a tropical climate, with a dry season lasting from four to seven months, and a rainy season of five to eight months. 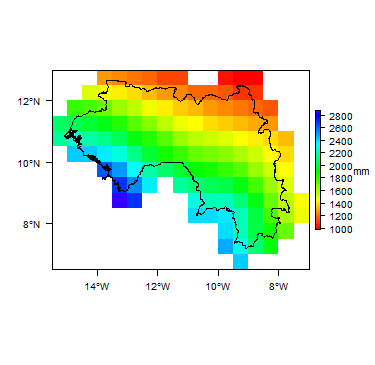 Average annual evapotranspiration ranges from 1,500 mm to 1,650 mm (Aquastat). The prevailing winds are monsoon and lharmattan, blowing from the Atlantic Ocean and the Sahara respectively. The climate varies across the country, controlled strongly by topography and proximity to the ocean. 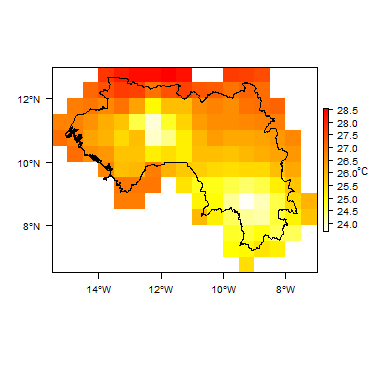 More information on average rainfall and temperature for each of the climate zones in Guinea can be seen at the Guinea climate page. Most rivers in Guinea originate in two mountains: the Fouta-Djallon and the Guinean. Surface waters are divided into 23 river basins, including 14 international basins. There are some 27 hydroelectric dams and many dams for agricultural water use. An overview of the hydrographic network and surface watersheds can be seen in Sidibe and Oulaye. The geology map shows a simplified version of the geology at a national scale. More information is available in the report UN (1988) (see References section, below). A more detailed geology map of Guinea, at 1:500 000 scale, is available as a scanned image from the Ministry of Mines, Geology and the Environment - Carte Géologique de la Guineé (Ministere de mines, de la geologie et de l’environnement, 2006). An accompanying report can also be downloaded - Géologie de la République de Guinée (Mamedov et al 2010). This report (in French) contains a detailed description of the country's geology. ancient granite and gneiss massifs, separated by valleys and lowlands. Dominantly Quaternary, to Tertiary Alluvial sediments in river valleys: sands, sandy loams, silts and gravels. Along the coast, marine loams, clays, clayey sands and sands. Large areas of the country are also covered with Paleogene-Neogene weathered lateritic crusts, containing iron deposits, kaolinitic clays and bauxite layers. Laterite is absent only on steep slopes and in valley bottoms, but even below alluvial sediments in valleys, the upper parts of the bedrock are often altered to clays (Mamedov et al 2010). Laterite is a key source of economic minerals in Guinea, particularly bauxite. Laterite development is strongly influenced by the hydrogeological regime, particularly water table depth and fluctuations (Mamedov et al 2010). Mesozoic Sills, dykes and other intrusions including dolerite, gabbro-dolerite, peridotite, pyroxenite, gabbro and syenite. Some kimberlite dykes and pipes in southern Guinea are diamond-bearing (Schlüter 2006). Silurian-Devonian Dominantly mudstones and siltstones, including the Silurian Télimélé Suite and the Devonian Faro Suite. Ordovician Dominantly sandstones of the Pita Suite. These include some diamond-bearing heavy mineralisation in quartzites. Cambrian Dominantly sandstones and conglomerates, including the Falémé and Falea series. Upper Proterozoic Dominantly metasedimentary. This group includes a number of different sequences in different parts of the country, including the Balé, Dabatou and Ségou suites, which are dominated by quartzites and arkosic sandstones; the Oundou Series, including argillites and alerolites; and the Bania Suite, which unlike the rest of the series is dominated by metavolcanic rocks. Archaean-Lower Proterozoic Crystalline basement rocks. Strongly metamorphosed rocks to amphibolite and granulite facies, and often greenschist, wtih dominant rock types include gneiss, schist, quartzite and amphibolite. There are also significant areas of granite and granodiorite. Lower Proterozoic rocks tend to be metasedimentary and metavolcanic rocks of lower metamorphic grade. Magamatic ultra-basic, basic and acid intrusions caused extensive contact metamorphism. 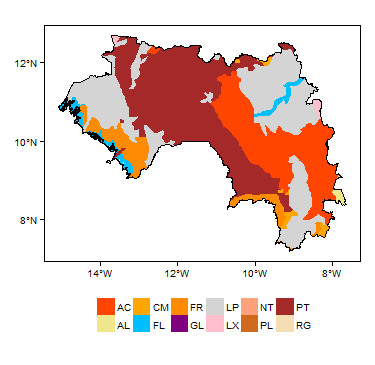 Relatively little is documented about the hydrogeology of Guinea's aquifers: their characteristics and groundwater potential. The hydrogeology map and table below provides a basic overview. Quaternary (to Tertiary) Alluvial and marine sands and gravels are likely to be highly permeable, and if thick enough, are likely to have high groundwater storage capacity. They are therefore likely to form productive local aquifers. Groundwater in these aquifers is likely to be in hydraulic contact with adjacent surface water - rivers or the sea. 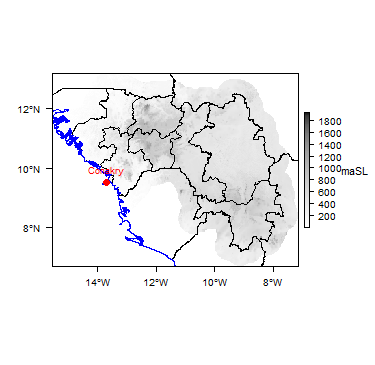 Along the coast, there is therefore a risk of saline intrusion if groundwater abstraction rates are high enough to draw down the water table below sea level. Mesozoic Igneous Intrusive rocks Very little is known of the aquifer characteristics of these rocks. They are likely to be crystalline with very low intergranular porosity and permeability, so that groundwater potential will depend largely on the degree and type of weathering and/or fracturing in the rocks. Groundwater is likely to be present mainly in the uppermost few tens of metres. Silurian-Devonian - probably Low to Moderate Productivity Silurian and Devonian rocks are dominated by fine-grained mudstones and siltstones, and are likely to form relatively low productivity aquifers. Intergranular porosity and permeability are likely to be very low, and groundwater storage and flow are therefore expected to occur largely in fractures, probably in the uppermost few tens of metres of rock. A transmissivity value of 7 m2/day was quoted for Devonian rocks in United Nations (1988). Cambrian-Ordovician - probably Moderate to High Productivity Cambrian and Ordovician rocks are dominated by sandstones, with some conglomerates in the Cambrian sequence. These are likely to be strongly indurated, so that intergranular porosity and permeability are likely to be low. Groundwater storage and flow are therefore expected to occur largely in fractures. A transmissivity value of 20 m2/day was quoted for Ordovician sandstones in United Nations (1988), but higher values may be more common. Precambrian: Upper Proterozoic - metasedimentary - probably Low to Moderate Productivity Upper Proterozoic rocks are likely to have similar groundwater potential to the Silurian and Devonian rocks, probably forming mostly low productivity aquifers, in which groundwater flow and storage occurs largely in fractures in the uppermost few tens of metres of the rock. Precambrian (Archaean and Lower Proterozoic) Crystalline basement rocks have virtually no intergranular porosity and permeability, and groundwater flow and storage is entirely dependent on the nature and degree of weathering and/or fracturing of the rock. A typical pattern in basement rocks is 'pockets' of weathering forming weathered basins, typically a few tens of metres deep and a few tens or hundreds metres across, in which there is enhanced permeability and groundwater storage potential. Typically, these kind of weathered basins have enough permeability and groundwater storage capacity to supply a borehole hand pump supply. Little is known of the actual status of groundwater across Guinea, but it is recognised that both groundwater and surface water face pollution pressures in many areas, including from urbanisation, industry, waste production and agriculture. The main use of groundwater is for domestic drinking water supply. The rural population and much of the poorer urban population relies on groundwater for their main water source, mostly from distributed, low-yielding hand pumps installed on boreholes and shallow wells. The table below shows the volumes (in millions of cubic metres) abstracted for drinking water by SEG from surface water and groundwater sources from 2010 to 2014 (Sidibe and Oulaye). These figures indicate that groundwater abstractions for drinking water nationally are about 17% of surface water abstractions. The country has recently adopted programmes for improving water services: the National Drinking Water Supply and Sanitation Programme (NDWSSP) and the National Strategy for Development of Public Water Services in Rural and Semi-Urban Areas (SNDSPE). These programmes aim to address the current situation where local authorities have low capacity to implement their responsibility for water service projects in rural and semi-urban areas; and water services are largely being developed in a fragmented project-based way (African Development Bank Group 2013). The Ministry of Hydraulics and Energy (MHE), through the National Directorate of Resources Management in Water (DNGRE), is responsible for developing and implementing the government's water policy, including regulation of water resources exploitation, protection and conservation of water, and user awareness. The MHE, through the National Service of Water Points (le Service national des points d’eau - SNAPE), is also responsible for the development of water points (springs, wells and boreholes) in rural areas, and for collecting and managing surface water and groundwater data. SNAPE has a central water point database with information on more than 16,000 water points - mainly boreholes. The data come from different projects that were supervised by the national water authority, but the data are not all well organised. The database does, however, include more than 1000 borehole geological logs that are easy to access. At the local level, water resources management is carried out by decentralised and local communities, such as Rural Development Communities (RDCs) and districts. RDCs apply customary law and practice, insofar as they do not conflict with the provisions of the Water Code. Exploitation and maintenance of water infrastructure is the responsibility of farmers and domestic users (isolated or in groups) through management committees. The fee systems are set by management committees that have a certain autonomy. The Guinea Water Company (la Société des eaux de Guinée - SEG) is the national water supply company. Land and water policies and legislation are formulated according to the Government's socio-economic development policy through different sectoral policy letters, on the one hand, and and the codes elaborated for the different sectors of activity of the national economy, on the other hand. The Water Code, 1994, which lays down the general framework for the management of the country's water resources. This law deals specifically with: the legal regime of water; the right of use; the prevention of the harmful effects of water; hydraulic works and installations; protected areas and protected areas; planning and administration of water resources; financing, pricing and international waters. The Land and State Code, 1992, which deals with sanitation problems (rainwater, wastewater, solid and liquid waste) and of urban hydrology. The Environmental Code, 1987, which deals in particular with inland waters (groundwater and surface water), maritime waters, and s for the protection of the environment. The Forestry Code, of 1989, which deals with the conservation of water and soils in relation to forest and wildlife resources. The Mining Code, promulgated in 1986 and revised in 1995, deals with groundwater and geothermal systems. The Public Health Code, promulgated in 1997, which deals with drinking water issues. References with more information on the geology and hydrogeology of Guinea can be accessed through the Africa Groundwater Literature Archive. African Development Bank Group. 2013. Institutional support for the national water point management service (SNAPE), Republic of Guinea. OWAS Department, December 2013. 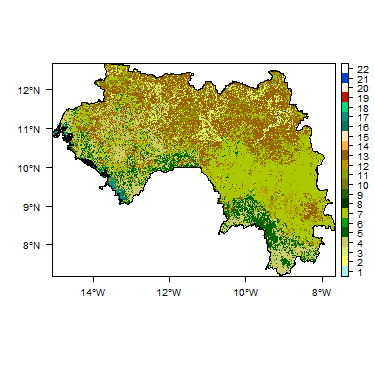 Fussi F. Integration of hydrogeological investigation, remote sensing and terrain modelling for the analysis of shallow aquifers in West Africa and the identification of suitable zones for manual drilling. PhD Dissertation, Department of Earth and Environmental Sciences, University Milano Bicocca. Fussi F et al. 2014. Promotion of manual drilling in Guinea. In: Shaw RJ, Anh NV and Dang TH (eds) Sustainable water and sanitation services for all in a fast changing world: Proceedings of the 37th WEDC International Conference, Hanoi, Vietnam, 15-19 September 2014, 5pp. Lacomme A, Delor C, Costea A, Egal E, Feybesse J-L, Iliescu D, Lahondere D, Goujou J-c, Thieblemont D and Theveniaut H. 1999. Carte Geologique de la Guinee a 1/500,000.- Ministere Mines, Geologie, lʼEnvironment, lʼappui technique BRGM, Aide et Cooperation francais. Republique de Guinee – Ministere de mines, de la geologie et de l’environnement. 2006. Carte Geologique de la Guinee: Echelle 1:500,000. L'eau en Guinee]. UNSD Togo Workshop, Guinee, Conakry. United Nations. 1988. 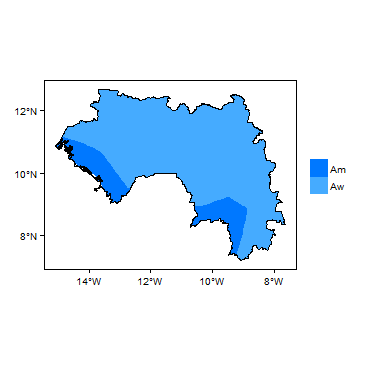 Groundwater in North and West Africa: Guinea. United Nations Department of Technical Cooperation for Development and Economic Commission for Africa, Natural Resources/Water Series No. 18. This page was last modified on 18 February 2019, at 10:06.